Why Electric Grills Are Different from Other Grills? What to Look for in a George Foreman Grill? The George Foreman grills have caught our attention for some time now, with their innovative take on grilling. These electric grills are definitely very convenient to use, and we at Grills Forever have tried and tested these models to see which one makes it to the top of the list. We had the help of our team and online reviews in order to come up with this list. We listed 25 features to compare each grill with, and after a few days of testing and research, we came up with this list. The GR 144 easily came to the top of the list, because of its amazing features at such an affordable and decent price. This George Forman is the ideal grill to use if you are cooking in big quantities. Although it lacks a timer and temperature control, it has everything else you could need including a big cooking area. Check It on Amazon ($41.41) Prices are accurate as of 23 Apr 2019 at 10:45 PM . Product Prices and availability are subject to change. Any price and availability information displayed on Amazon at the time of purchase will apply to the purchase of any products. What stands out with the GR144 is how incredibly cheap it is. But not because it has little to boast of, in fact, it is packed with features that make it such an amazing electric grill. First off, it can easily cook up 9 servings of food at a time. Plus, George Foreman’s trademark feature of cooking lean meat every time is achieved by the slanting slope design, letting you cook your meat while removing the fat. Added features include the cooking plates that are dishwasher-safe. This GR144 will definitely give you leaner meat at a very affordable price. This George Foreman came in second place, as it is great, but not quite as compact as some of our other picks. You can use it inside and outdoors and it is reasonably priced as well. Check It on Amazon ($117.99) Prices are accurate as of 23 Apr 2019 at 10:45 PM . Product Prices and availability are subject to change. Any price and availability information displayed on Amazon at the time of purchase will apply to the purchase of any products. What sets the GGR50B from the rest of the GR grills is its digital timer with temperature control. It also has a large cooking space at 250 square inches, which means you can easily cook for a party of about a dozen or more people. It also comes with an outdoor stand, so you can use it outdoors in the warm months, or indoors during the colder months. It’s perfectly safe and efficient, and ideal for apartments and small spaces. It is priced slightly higher than the CR144, but still very affordable at under $100. This grill is our budget George Foreman, but it still has some great features. It is quick and easy for feeding a family and it is small enough that you won’t notice it taking up loads of your cupboard space. When it comes to affordability, this electric grill definitely takes the cake. Priced under $40, it has the best price to feature value among our picks. If you’re one who likes a simple, no frills grill, then this is your best option. It boasts of ceramic plates that heat up fast, a drip tray and the trademark slope to remove excess oil from your meats. It’s compact, with around 72 square inches of cooking space that can cook up to 5 servings at a time. It’s perfect for small families to spend some quality times on their backyard. It also gives you the option for vertical storage to further save space in your countertops. This George Foreman boasts a digital control panel and some more advanced features, that give it a slightly higher price tag. It is versatile and will always give you an even cooking finish. Check It on Amazon ($98.35) Prices are accurate as of 23 Apr 2019 at 10:45 PM . Product Prices and availability are subject to change. Any price and availability information displayed on Amazon at the time of purchase will apply to the purchase of any products. If you’re looking for advanced features and versatility, the GRP4800R is perfect for you. It lets you grill, bake, sear, saute, toast, griddle and even make waffles! It comes with ceramic grilling plates, a baking dish, and a muffin pan. Plus, it has a digital temperature control, which makes it very easy to set your desired temperature and cooking time for precision cooking. It also comes with the trademark George Foreman classic slope, with its adjustable angle so you can choose whether to cook flat or at an angle for fat removal. It’s full of features that make it a versatile cooking item, all for a price under $100. Buying a new grill is a pretty big investment. We’re not just talking price wise here, buying a grill means investing in family get-togethers, reunions with friends, or even the next neighborhood BBQ. A good grill makes a backyard, and that’s precisely why giving thorough consideration to only the top retailers is so important. George Foreman has been making grills for a long time, the name is almost synonymous with quality grills; you might just find that the neighbor next door with the perfectly cooked food at every BBQ is using a George Foreman model. We’ve worked tirelessly to fully research George Foreman’s entire product range to whittle down their brilliant products to only the best of the best. We’ve come up with our Top 10 List – a comprehensive list with the best products in a range of categories to ensure that you find exactly what you’re looking for. If you’re feeling at all intrigued, or perhaps even desperate to find out which George Foreman grill really is the best, read on to discover the best George Foreman grill review around. Here at Grills Forever, grills really are our entire focus and providing you with the best George Foreman grill review is our aim. We’ve researched all kinds of them, all types of brands and read countless reviews either slating or commending them. It’s this kind of seasoned experience that you should let set your mind at ease. Overall, we’ve around 5 full years of methodological product research, this has led to us honing in over time on exactly what it is customers look for and need. We do, of course, tailor this per individual grill type and brand. 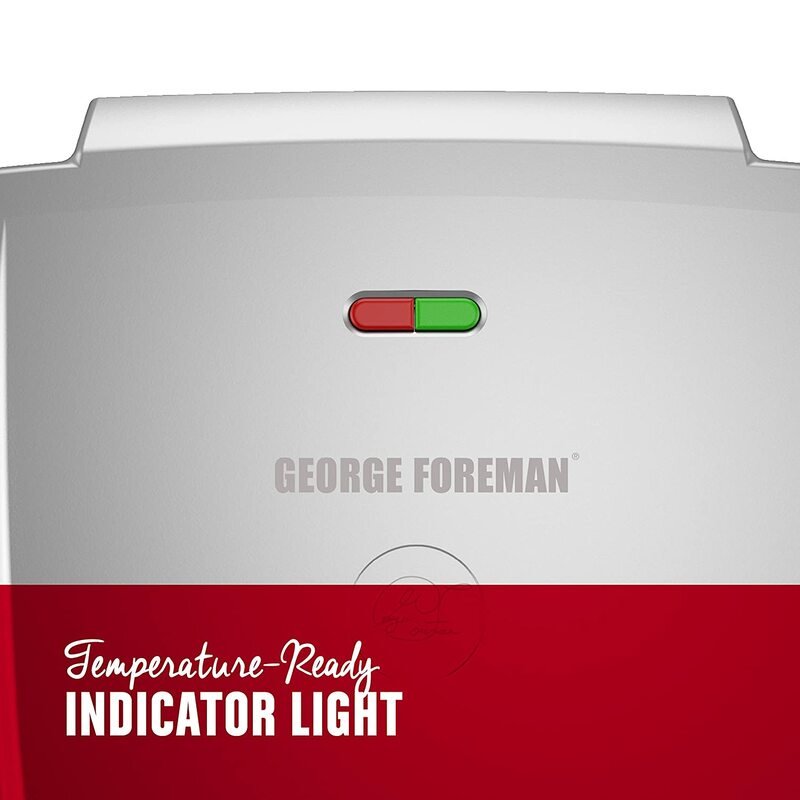 With George Foreman’s range, it took around 72 hours of full research, exploring customer reviews, product manuals and of course the company website to discern exactly what types of grills from their range were best for you, our readers. Just to clarify, we’re really not aiming to sell you anything here either; we focus on unbiased information, and with this in mind, our focus is to ensure that you know every relevant fact to do with our top 10, so you can decide which one is the best fit for you and your lifestyle. We use a diverse team of researchers here at Grills Forever, deliberating with a focus on a lack of bias, and ensuring that every product we do rate is worthy of not only our time and effort, but your time too. No matter who you might be, a professional chef or just a casual, backyard BBQ, outdoor party enthusiast, we’ll have a premium, top-rated product on our list for you. George Foreman, as we all know, is a professional boxer. Aside from his lucrative career in the ring, his name has become synonymous with that of a quality grill. Thanks to the technology and development of Michael Boehm’s initial concept, George Foreman grill have become an incredibly successful venture within the grill universe. The unique sloping design of the grill itself ensures ultimate grease and fat removal from whatever you decide to cook (although, meat definitely is a winner ingredient with it). You can expect a fat reduction of up to 42% every time you use this grill, to help ensure that the meat you’re consuming is as lean as humanly possible. Most importantly, this process is convenient too, with a removable, dishwasher safe drip tray included on every grill with the George Foreman name. The technology was initially developed in the year of 1994, the past 24 years have served as the finishing ingredient in ensuring that this product truly is supreme. With sale rates surmounting to around 100 million, these grills are clearly popular for a reason. Years of development as well as refinement has been underway, with the current grill models often featuring digital interfaces, ceramic coated pans, or, if we’re talking top-end grills – removable, customizable coated pans to fulfill your every grilling whim. There are three different ranges under George Foreman grills, all of which have been refined to ensure that they’re in line with their individual target audience. These include Basic, Advanced and Premium George Foreman grills. Basic grills are perfect for those who simply want to reap the fat-reducing benefits without focusing on more complex cooking methods or ingredients. They also tend to be a smaller size, and are often a brilliant choice for small families or singles. The advanced grills are brilliant for connoisseurs of cuisine, with a greater array of function. Premium grills feature premium quality equipment, this is particularly true of the pans, which tend to be coated with the more expensive ceramic. Today, George Foreman grills have an astounding range of grills to fit a multitude of purposes, from an amazing outdoor BBQ all the way to a more professional option. No matter what exactly it is you’re grilling, or who you’re grilling it for, George Foreman’s comprehensive range will have something for you. Electric grills are primarily clean, they offer an inexpensive, hassle-free way to procure perfectly grilled food time and time again. With George Foreman models featuring removable pans, they’re easy to clean as well as wonderfully convenient. Electrical grills are compact too with some offering vertical storage, making them great for smaller kitchens or just a tidier minimalist aesthetic. Electric grills make brilliant use of the energy source, and often take up very little wattage. This makes them an effective, efficient way to cook. Unlike charcoal grills, electric grills are quick to heat, and are safe too, with non-conductive casing and easy to read and control dials. The direct application of heat within the grill is an easy way to maximize cooking time. As they do need to be plugged in an electrical outlet, it may be best to use an electric grill indoors. In fact, electric grills are often apartment approved. Let’s say, you’ve moved into a new apartment block and find yourself reminiscing about how great meat tasted on the BBQ, with the summer months just round the corner, or even with heading into winter, the convenience and warming, delicious flavor of grilled food shouldn’t be confined to being outdoors or having a backyard. Electric grills offer the perfect solution to apartment owners, in delivering a mess-free, easy clean option. Cooking Area – The cooking area of a grill tells you exactly how much food you’ll be able to cook at a time. The measurements tend to be in square meters, so bear this in mind. The amount of space you’ll need will directly depend on your intentions for use; is it going to be for large groups? Or just your family? Maybe you’re looking for something in-between? Don’t worry, we’ll walk you through what fits you best as we go. Temperature – What sort of temperature range are you looking for? A higher temperature range means more opportunities for extreme cooking. Alternately, what sort of temperature control are you looking for? A quick heating grill, a grill that spreads heat evenly? If you’re focused on charring, or just ensuring a good seal of juices, the temperature capabilities of your grill are fundamental. Drip Tray – This is an essential feature for any good grill. A drip tray collects fat and oil as the food cooks, making for an easy cleanup. The presence of a drip tray indicated consistent, even cooking for the fat to have melted off the meat in the first place. Warranty – A good warranty means you can rest assured that your grill will be a permanent member of your backyard. Having a table, reliable warranty behind your grill purchase will set your mind at ease, and even take away from some of the pressure that you might feel under in ensuring it stays in its prime. Accessories – Some George Foreman grills come with extra accessories, either included or recommended to pair with the model. These include recipe books, cooking equipment, safety apparatus, and weather protectors. Alternatively, they may also include a removable stand or a convenient digital timer. George Foreman grills often come equipped with George Foreman grill removable plates, these are specifically designed by the company to best befit every grill they manufacture, and make cleaning up quick and convenient. Here at Grills Forever, we value complete transparency every step of the way in our reviews (it’s part of what makes this the best George Foreman grill review around!) In being open, we’re willing to reveal our highly researched and developed process by which we came to our picks. We started with a huge mass of 19369 customer reviews from a huge variety of 45 different pieces of equipment. Ranging all the way from the George Foreman indoor grill, to the classic George Foreman electric grill, as well as everything in-between. We carefully read through these reviews to determine what exactly it is that customers idealize with a George Foreman grill, and created a checklist of characteristics. We used this checklist throughout the research process to help cut out those products that perhaps didn’t meet enough essential criteria to be considered for the best George Foreman grill review. From our initial 45 George Foreman grills, we managed to cut things down slightly using the checklist to 20. We researched these 20 in depth, strictly adhering to our characteristics checklist here, whilst also researching the consistency of product description and reviews across a variety of different online platforms. We did this to reliably ascertain just how efficient these grills were; a valuable resource we often refer to is bloggers; some bloggers write detailed descriptions of their experiences with certain grills, and this provides us with valuable insight. To take things a step further, we then hired a group of extremely willing volunteers (from a diverse background to ensure the reliability of course), and allocated them each, one of these 20 grills. We asked them to note down their experiences and personally check off some relevant criteria from our ideal characteristics checklist. Doing this provided us with direct data we could trust, even if it wasn’t all that representative. We cross-referenced our personal research with the research we’d done online, which of course had a huge population base from the 19369 different customers we’d used to reference. After doing all of this, we managed to confidently eliminate 10 grills from our 20, leaving us with the top 10 best George Foreman grills available, and by extension, the best George Foreman grill review of 2018. So, in compiling the best George Foreman grill reviews, we relied on superior analysis methods as well as our own personal research. Most of our analysis relied on a characteristic list of 24 different ideal features for a George Foreman grill. We discerned these features as the result of scouring through around 10,000 customer reviews, as well as referencing general product descriptions/manuals and our own experience. We’ve based our picks on the basis that they’ll appeal to a wide range of people. In saying this, you can expect some high range products and some more affordable options. Cost has been carefully considered and even the more expensive grills listed here will get you the most bang for your buck. Most importantly, we haven’t just relied on the internet here, we did conduct personal research and cross-referenced our findings with the mass of customer reviews from the internet. In doing this, we’ve been able to completely eliminate any obsolete, or even outdated products from our list, and have only included those products that will deliver efficiently and effectively. Why Is This Our No 1 Pick? This product has won our hearts from among so many other choices for its delightful features, which we will explain below. But before doing that, let me tell you why this product is simply too awesome compared to its counterparts. Our research analysis showed that this product has 18 positive features out of the total 25 features that we have considered for all our selected products. Although this is the highest number of positive features for a product in our list, if we had to consider the value per dollar aspect, this product gives maximum features at a decent price. This is why we chose to crown it as our top pick. This product costs around $50 which is in the median of the price range compared to others in the same category, making it very affordable product in the market. Given the number of features it comes with, this product gives you a bang for the buck. With an average user rating of 4.2 at the time of research and more than 1000 user reviews, we can assure you that this product is a favorite among the users. The rating is the third best in our list. Also, the product has a great review frequency, which is 10 reviews in the latest 38 days, 10-20 reviews 40 days earlier, and 20-30 reviews 38 days earlier than that. Quite a popular product isn’t it? Lastly, this product was destined to become our top pick because of its ability to feed an entire group of people. So they can have all the food they want and also grab the leftovers. With a stunning grilling surface of 144 square inches, you get to have a maximum of nine servings in one time. So cooking for a large number of people would be like a breeze, and cleaning would also be easier. This grill easily cooks around 9 servings at once, there’s no floating hinge but the grill is completely fine for grilling larger hunks of meat as the reviews indicate. The grill itself is considerably larger than our top pick, meaning you might need a good worktop to store and use the grill on. This grill is so easy to use and understand, with a clear indicator light, as well as removable durable plates. The plates are totally dishwasher safe, making cleaning that little bit simpler. The drip tray is also removable and dishwasher safe, making this grill quick and easy to clean up for its next use. The George Foreman patented slope ensures ultimate fat removal, whilst the generous cooking space means you can get the most out of your grill. The grill’s quick to heat despite its large surface area, making it easy and efficient to use. This grill isn’t ridiculously cheap, nor is it expensive, you can expect to pay around $50 for this grill, noting that the amount of cooking space you get with this grill is exponential and will allow for leftovers (think of the work sandwiches here!) There’s a strong positive customer response with over 4 stars on Amazon, as well as a limited warranty included upon purchase. This grill is the perfect option for large families or even a dinner party enthusiast. With an average price tag, as well as premium cooking plates that are of course totally dishwasher safe, this grill allows for efficient, effective and moreover, mass cooking at a great standard. The fat removing slope design is another benefit, meaning that every piece of meat you do cook with this grill will be as lean as possible. Why Is This Our Runners Up Pick? This product gave tough competition to our top pick. It has the highest number of positive features, which is 18 out of the 25 total features we considered for all the products (which is also tied with our Top Pick). However, This product buy would have been our top pick as it has more number of servings but we had to place it to our runner’s up due to its price and few of the users were not satisfied with the design of the drip tray. The price of this product is around ($80.00) which is in the above average price range and expensive compared to our Top Pick. Thus, in terms of value per dollar, you would have to pay a bit more for the same features available at a lower price in the top pick. According to our research analysis results, this product comes with an excellent average user rating of 4.4 in Amazon, accompanied by more than 2500 reviews. Clearly, these values are more than that of our top pick. Even the review frequency is better, which is 10 reviews within 8 days, 10 reviews 12 days earlier and 10 reviews 14 days earlier than that. With this we can say that many people appreciate this product, however, its high price caused us to announce it as runner’s up. This product comes with a unique feature, which is not found in any of the other products in the list, that is a digital timer and controlled function. Also, its grilling space is a whopping 240 square inches, which is enough to feed an entire BBQ party! This grill has a contemporary look that borders on space age; with a stylish, stainless steel domed lid. The grill is designed specifically with apartment owners in mind and is entirely approved for indoor use, despite its ambitious aesthetic and size. The grill allows you a full 240 square inches of cooking space; so, enough to cook for around 15 people at a time. It also weighs in at around 4.1lbs. It’s surprisingly portable despite the amount of cooking space you get; making it perfectly practical. The removable outdoor stand ties into this practicality, allowing you to make the most of the great outdoors and weather in the summertime, and stay cozy and cooped up when it gets to the colder months. The grill plate itself is conveniently removable, meaning limited water contact with the console and a longer lasting grill. 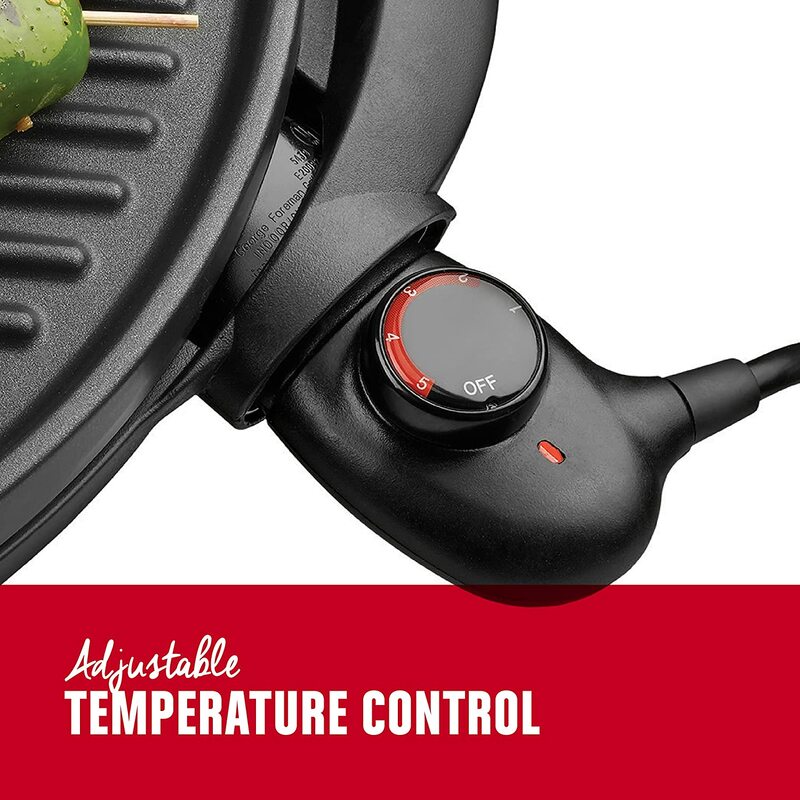 The temperature can easily be adjusted with a convenient dial; meaning you can adapt the grill to whatever suits you best. There’s even a handy removable drip tray that works to collect every bit of fat the grill gets out from your food, making for an easy cleanup and a wonderfully light meal every time. In place of an indicator light, this electric grill comes equipped with a handy temperature dial, that allows you to meticulously control the cooking of your food. There’s enough space on this grill to easily accommodate 15 different people’s dinners, making it amazing for large parties, or even larger families. The grill is quick to heat too, and of course, with being a George Foreman grill, has the patented fat removal slope design that eradicates up to 42% of fat content from every piece of meat you cook on it. The grill even comes equipped with a handy counter-top stand, making kitchen cooking ridiculously simple and safe. This grill has a 3-year limited warranty included with purchase, meaning its longevity is pretty much guaranteed. The customer response has been immense, with apartment owners reveling over just how convenient and safe the grill is to use! This grill is the perfect solution to both indoor and outdoor cooking, it gives you a multitude of cooking opportunities with a diverse range of cooking temperatures available, as well as the huge surface area. This grill is slightly more expensive than our top pick, but when you consider the added features; like the outdoor stand, in particular, it’s pretty clear that the price shift is well deserved. This grill is versatile, safe and wonderfully efficient too. Why Is This Our Budget Pick? As the title suggests, we picked this product as our budget pick because of its price-to-feature ratio. It has the second lowest price in our list, which is around $36, with 13 positive features. Though it has a relatively lower number of positive features, you’re getting that many features at a lesser price. So, it’s safe to say that the product provides great value per dollar. It’s third place since it has a lower number of positive features than the top pick and the runner pick. At our time of research, we found that there were around 1500 user reviews, but we were also surprised that the average user rating was 4.0. This is the second highest among the lower priced models. The review frequency is 10 reviews in the latest 8 days, 10 reviews 12 days earlier and earlier 10 reviews 14 days before that. This tells us that people actually like this product, because of its affordability and value per dollar aspects. This grill has a good modern design, and above all, comes with a vertical storage option, making it perfect for those with limited space. The grill is decent sized, with a 72 square inch cooking space; enough room for around 5 portions. This makes it perfect for a smaller kitchen and the whole family. The plates for this grill are doubly reinforced with a durable coating, resulting in a reduced need for butter or oil, and allowing for a healthier, lighter meal. With removable plates, this grill is easy to clean and maintain. There’s a drip tray included as always, that is removable, making clean up for that part easy. The grill is equipped with a temperature indicator light for your convenience. This light turns on when the grill is preheated and ready to use. This grill is built to feed the whole family in only one cooking session. It does heat up rather quickly even with its bigger size; which is an added benefit. The grill also has the patented George Foreman, fat extraction slope of which ensures a healthier meal. This grill is wonderfully affordable and tends to retail at around $35 (add a dollar or so for the vertical storage option). 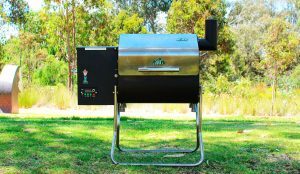 The grill has brilliant reviews, mostly from people who enjoy the decent size, and general convenience of being able to grill and clean quickly and simply. There’s a 3-year limited warranty included too, meaning that this grill will last you. If you’re looking for a quick, easy solution for 5 servings, this is perfect. It’s small enough to pop to the side, with a fast heating surface that cooks meat well and cleans easily. And it’s just enough to give you the cooking space you need. This product has 17 positive features out of the 25 that we considered for every product. However, this product has a heavy price tag of $90, which is why we couldn’t place it at the winner spot. However, the price seems justified because this product comes with the most exclusive and advanced features, and hence we have labeled it as the Advanced Pick. User average rating at the time of research for this product is 4.0, which is quite high in our opinion. It has around 1300 user reviews, the fourth highest in this latest. The review frequency is 10 reviews in 14 days, 10 reviews 11 days earlier and 10 reviews 11 days earlier than that. All these aspects show that the product has been well accepted by the people who bought it. This product is extremely versatile. It comes with grill, bake dish, panini press and muffin pan features and the Evolve multi-plate grill system. So our Advanced Pick would definitely topple the top pick, if it were not for its high price. Let’s start out with a reminder of just how unique this grill is; it allows you to cook up to 4 different types of food all in one; all at once! There are a variety of George Foreman Grills removable plates available for this grill, all of which function seamlessly to deliver consistent heat distribution and optimum cooking. The grill comes in three different colors too; red, steel, platinum and black, meaning you’re guaranteed to have a home appliance that fits in with the rest of your kitchen. The grill has a good size, and is designed to cook up to 5 portions of food at once, making it perfect for families, or having a group of friends over. Every one of the plates included within this grill is entirely removable, and constructed from premium non-stick ceramic, making them easy to clean and brilliant to cook with. The grill also comes equipped with a removable drip tray, so fat and oil can be discarded of in a flash. The temperature can be easily controlled with a digital control panel, of which displays the temperature clearly – so you can be sure of how long you’re cooking your food for, and at exactly what heat. The digital control panel really sets this grill apart from the competition, with a timer included for ease of use, as well as a clear interface with the temperature displayed. The grill can be angled slightly at your convenience to allow for optimum fat removal from food, with a drip tray collecting every excess bit of fat extracted, or alternatively, left flat. A high-heat searing option is also available, of which works perfectly to seal in juices of prime cuts, leaving a restaurant-quality finish to food, every time. This grill doesn’t only grill (thanks to the range of plates), it griddles, bakes, sautés, toasts and sears. The inclusion of a waffle pan is also a wonderful touch that makes this grill compatible across meal-times. This grill comes with a 3-year limited warranty included upon purchase, with a whole host of positive reviews in its wake, this unique grill is a worthy addition to any kitchen. This grill is perfectly versatile in every way; not restricting things to simply grilling, it allows you to bake a range of goods, and cook in whatever way you feel best. The digital interface makes use a breeze whilst the high quality ceramic pans deliver optimum heat distribution and cooking time after time. This George Foreman isn’t designed to cook for a dinner party, instead we think it is perfect for a family of three. It has ceramic plates and a good cooking space, although isn’t as compact as other choices. Before we get to the review, we’d like to give you a heads up on the alternative option available with this grill; it comes in two different colorways (equally stylish), with a red or black case available for purchase. This grill has a good cooking area, that allows for up to 5 portions of food to be cooked at once within its 72 square inches. It weighs in at around 8.5lbs so is fairly easy to move around the kitchen, with a stylish design that helps it to fit right into your home. This grill has removable plates, which are completely safe for dishwasher use. The plates themselves are coated with durable ceramic which ensures an even cook. There’s a handy removable drip tray too to help dispose of any fat or liquid that seeps from the meat. In short, using this grill is a piece of cake, even for the beginners. This grill is equipped with a 1-inch floating hinge to allow for the widest of foods (your next toastie will slot in just fine). There’s an easy to understand indicator light on the hood of the grill, but no temperature control. The grill is quick to heat, with the patented slope for fat extraction included. With a three year warranty and steadily positive customer reviews, this grill is pretty good in our books. It retails for around $49 making it moderately priced. One thing to bear in mind is that the 5 serving size does depend on what exactly it is you’re cooking; if its 5 chicken breasts, they may not all fit at once (as one reviewer indignantly noted). This grill is the perfect option should you be cooking for any more than two people, but certainly no more than 5 (we think its great for 3). The grill has a good cooking area, with ceramic plates ensuring a premium cook and an easy clean too, with them being dishwasher safe. If you are looking for a George foreman that is a moderate price and gives you a moderate result, then this is the one for you. It lacks a temperature control, but is quick to heat and has a big cooking area. With a crisp, modern black and white design, this grill will fit seamlessly in any modern kitchen. There’s a 72 square inch cooking space, as well as floating hinge of which is capable of allowing up to 2 extra inches! This makes it the ideal grill for cooking whole veg (think of braised carrots here), or just your hunks of meat. The plates for this grill are triple reinforced, this means that they’re entirely non-stick. They’re simple to wipe clean, but to make things all the more simple, they’re dishwasher safe! With a simple click, you can remove the plates and pop them into your dishwasher once cool. There’s also a removable drip tray of which is also dishwasher safe, saving you the hassle of having to manually clean up your grill. There’s a nice, easy-to-read indicator light atop the lid of this grill. There’s more than enough cooking space to cook for a small family or just a group of friends. The grill heats quickly too, utilizing George Foreman’s recent surges in development. Of course, this grill does come equipped with the patented fat removing slope design of which will eradicate fat and grease and help ensure a healthier meal. Like all George Foreman grills, there is a limited warranty included. With around a thousand satisfied customers on Amazon and an overall rating of four stars, this product is consistently popular amongst a large customer base. With a moderate price tag of just under $60 you can be sure of a quality product for your money. If you’re looking for a moderate sort of grill for a moderate sort of price, this might be your best bet. With consistently positive reviews as well as being pretty easy to use, this grill is simple and effective. The lack of temperature control might not make it the perfect choice for all you cooking aficionados out there, but the floating hinge is a useful aspect that might just make up for it. 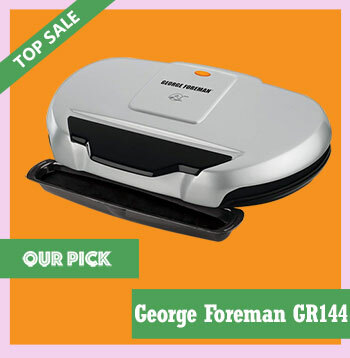 This George Foreman comes in array of colours to suit your kitchen decor. Again, it lacks a temperature control, but is affordable and has a great amount of cooking area for you to work with. Before we get into the review, we thought it would be good to let you know that this grill does indeed come in more than one colorway; you can buy it in either platinum, or black, for the same price – making it perfect for your kitchen. This grill will allow you to cook around 4 portions of food at once, with a quick heat up time, a floating hinge and an overall sleek look. Above all, it does come in more than one color as mentioned above, so you can choose a grill to match your kitchen specifically. This grill has a convenient drip tray for easy clean-up of fats and oils. The grill doesn’t have specific temperature controls, but does have a consistent heat distribution; thanks to the highly developed plates which are coated with a durable non-stick. The trays are also conveniently removable, meaning you can pop them in the dishwasher and save yourself time at the sink. There’s an easy-to-read indicator light atop the grill lid so you know exactly when its ready to use. The grill also has the patented George Foreman slope design that prioritizes fat extraction from meat. Another added benefit to this grill is the floating hinge which allows you to grill meat and vegetables of varying widths. Warranty wise, there’s the typical 3 years limited included. 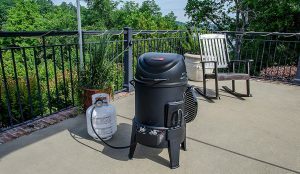 The customer response to this grill has been consistently positive, with individuals finding it easy to use and clean. The grill retails for around $36 on Amazon, making it affordable too! This grill provides the perfect compromise between being affordable and providing substantial cooking space. The floating hinge allows for versatility ingredients wise whilst the removable plates ensure a quick and easy clean so you can focus on enjoying your meal. This George Foreman choice looks good and is a middle of the road choice. It lacks temperature controls, but has a nice fat reducing design that means your food will cook healthily. Foremostly, we’d like to iterate that this grill doesn’t only come in red, it’s also available in a stylish black color; so if you’re going for bold or discreet, George Foreman have you covered. This grill provides around 72 square inches of cooking space; that’s just enough for around 5 portions, making it perfect for small families or get-togethers with friends. The grill even comes in two different colorways, meaning you can add a personal touch to your choice. The plates for this grill are coated with extra durable non-stick coating, this means an even cook and a brilliant finish to food, as well as a reduction of the amount of oil or butter needed. The plates are removable too, to add to the convenience, and can even be popped into your dishwasher once cool to refresh. There’s a drip tray that collects all the fat so you don’t have to, and is removable and again, super easy to clean. There’s no temperature control with this grill, with an indicator light showing when the grill is ready to use. This happens fairly quickly, thanks to George Foreman’s advanced technology. The cooking space is fair and allows for a variety of foods to be cooked at once, including ham, briskets, pork butts, and so on. The patented slope ensures an ultimate fat reduction in food, eliminating up to 43% of fat! Considering this grill only costs around $43, it’s a pretty great buy. Customers rated it with an overall 4 stars on Amazon, although not many have bought it; with only 434 listed reviews at the time of research. It’s its lack of current popularity that led this grill to the last place. Overall this grill doesn’t fare too badly, the plates are removable and dishwasher safe to save on time and energy, and there’s a 3-year (limited) warranty included upon purchase. The price isn’t extortionate either if you’re willing to sacrifice temperature control it may be the right grill for you! This George Foreman is another choice for cooking for lots of people. It also has a good number of features like its removable drip tray and plate, and unlike other options it does come with temperature controls. Like all George Foreman grills, this grill has a wonderfully modern design. This grill has a stainless steel exterior of which melds perfectly within typical kitchen décor. There’s a substantial hinge allowance that will allow you to cook around 8 servings, which is a good amount of meat or even vegetables no matter the width. The grill itself is simple to use, with an adjustable temperature dial that allows you to control exactly what temperature your food is cooking at. The grill is notoriously easy to clean too, with removable plates and a removable drip tray, both of which are entirely dishwasher safe. There’s a clear indicator light atop the lid of the grill of which allows you to see when the grill is dangerous to touch, and when it’s cool. To make things all the more versatile, there’s a controllable temperature dial of which allows you to tailor the temperature to precisely what it is you’re cooking; be it veg or meat. The patented slope design ensures ultimate fat extraction from meat, time after time. This grill retails for around a pretty hefty $60, this isn’t too expensive, but not all that affordable either. 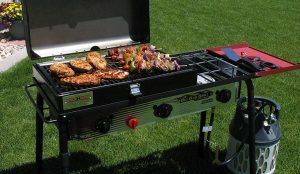 Do note that most other grills that don’t offer temperature control, this grill is pretty unique in including removable plates, temperature control as well as a substantial cooking area. The reviews are positive, with a customer rating of around 4 stars, with around 400 customers listed on Amazon alone. This grill offers the perfect solution for those looking to cook for large numbers of people, perhaps with a range of ingredients in play. If you’re a slightly more technical chef than most, and like to maybe sear, or even lightly grill rather than simply use an overall grill heat. This grill offers something that allows you to do just that, with a good size cooking space and even a decent price tag to match. This product comes in a steel build with a decent dimension, but it’s also one of the heaviest products in our list. The handles come with Cool Touch Hand technology, which prevents the handle from becoming too hot for the user’s touch. It also has a removable stand for your convenience. This grill comes with five removable plates, which are also dishwasher safe, which means the cleaning system is easy. Additionally, these plates hold the capacity to perform baking, grilling and griddle cooking along with paninis and waffles. Although there’s no heat control technology, it does come with the Fast Heat option, which allows you to quickly heat and serve food. There’s also a drip tray to ensure that the food that cooks while grilling and falls off can be collected, for your ease of cleaning. The cooking space is 72 square inches, enough for serving up to 5 people. This product also comes with a patented slope. Like all other George Foreman Grills products, this product too comes with an exclusive feature, which is the George Tough scratch-resistant, triple-coated nonstick coating that is effective in preventing grill rusting. This product comes with a 3-year limited warranty. So you can rest assured if any parts of the product get defected. User ratings and reviews are also quite good so the users are quite happy with the product. This product is suitable for people who not only want their grills to look good, but also perform well in terms of functionality, although this might come at a heavy cost. If budget is not an issue, you get to effortlessly grill and cook using multiple plates that are easy to use and easy to clean. Patented slope – This term refers to the way the slope design of the grill itself is unique to the George Foreman brand, as it is patented by the company. This means that George Foreman grills are the only grills with this feature. Floating Hinge – A floating hinge operates to allow the lid to move away from the base and float. To be technical with things, a floating hinge enables 2 parallel rotation axes for both the lid and the base, whilst allowing each of these to be moved in relative position. They also look cool. The removable drip trays are, for all intents and purposes dishwasher safe; no matter what model of grill you have. Most grills are fine for making pizza; make sure you’re using a pan with a floating hinge with enough space to not touch the cheese if you want to give it a try. The grills are totally compatible with meat soaked in marinade. Do note that some customers found that the herbs they topped their meat with burned slightly; sticking to the liquid stuff may be wiser. Grill specific recipes are available all across the web should you want to feel a little more inspired. George Foreman grills are pretty easy to clean, there’s no need for immersing the grill itself in water, nor fully washing the entire appliance (doing so will probably result in electric shock or injury). Never use scouring pads on a grill either; especially the indoor models, doing so will remove the non-stick layer from the pan and basically make the grill useless. A convenient way to clean the grill is to place a damp warm cloth in between some tongs, and whilst the grill is still hot post use, wipe down the surface using the warm cloth, being careful not to drop it. Alternatively, if the grill has removable plates, wait for the grill to cool, carefully wash and dry the plates, taking care not to use a scourer nor scratch the surface, and replace in the appliance. The basis for caring for the grill is to ensure that the appliance itself largely stays dry, you want to wash the plates regularly using a sponge whilst ensuring that the non-stick surface doesn’t become scratched or damage. If you’re lucky enough to have a George Foreman model with removable plates, or an extended warranty, if the plates should become damaged over time, you’ll be able to replace them fairly easily. Overall, following this cleaning advice, and of course, the manufacturers instructions, will ensure the longevity of your grill and a better grilling experience. George Foreman’s grills are entirely unique thanks to the patented fat reduction technology. Due to this, they’re the perfect investment should you want to switch things up to a healthier lifestyle. They make healthy eating simple, and even convenient thanks to the dishwasher safe plates, and removable drip trays. The grills look modern, and not only that, stylish too; with a range of color options often being available to suit your kitchen. George Foreman’s grills we’ve covered here are versatile not only in the way they look, and in what they can do, but in who they appeal to. We’ve listed grills from a variety of price ranges and even sizes to fit you – no matter who you may be; from a single pringle all the way to a busy mum of 6; you’ll find a grill that suits you the most. In choosing George Foreman you’re making a conscious decision to prioritize your health, with ensuring limited fat intake. Above all else, you’re placing your trust in a brand with countless years of experience refining and developing grills. The current models are efficient and far more effective than older ones; so even if you’re a George Foreman grill owner already it may be worth considering an upgrade. We hope that we really have provided the best George Foreman grill article here, in covering a wide array of grills to suit a variety of lifestyles. If you’re still curious to see how and why these were our picks, why not check out our in-depth report? Otherwise, we hope you feel a little more informed as to what grill suits you the most after reading through this article.